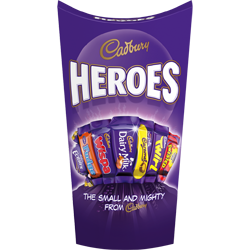 Launched in September 1999, Heroes are a mix of miniature bites available in carton and tub formats that are ideal for sharing. 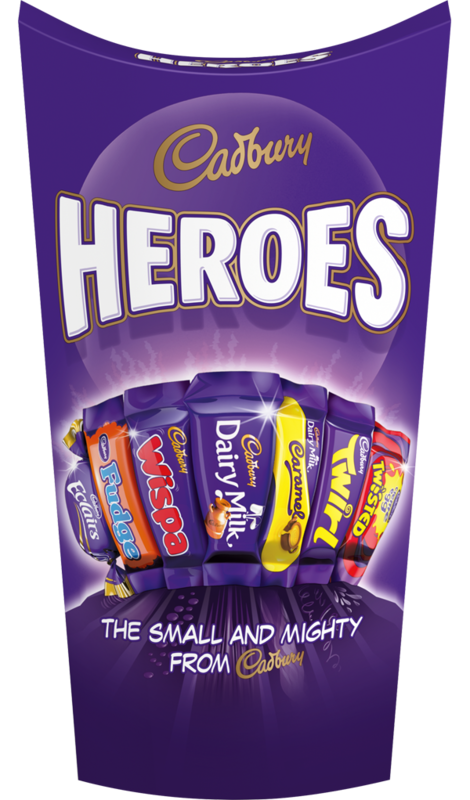 Heroes fans love to rummage in the box to find their favourites, including Cadbury Dairy Milk, Cadbury Dairy Milk Caramel, Twirl, Wispa, Eclair, Fudge and Creme Egg Twisted. Milk, sugar, glucose syrup, cocoa butter, cocoa mass, vegetable fats (palm, shea), glucose-fructose syrup, whey powder (from milk), whole milk powder, emulsifiers (E442, E471, soya lecithin, sunflower lecithin, E476), skimmed milk powder, humectant (glycerol), whey permeate powder (from milk), milk fat, salt, molasses, flavourings, sodium hydrogen carbonate, colour (paprika extract). MILK CHOCOLATE: MILK SOLIDS 20% MINIMUM. MILK CHOCOLATE: MILK SOLIDS 14% MINIMUM. CONTAINS VEGETABLE FATS IN ADDITION TO COCOA BUTTER.